WHERE DO I LOCATE MY GARDEN? Just as it is said in the real-estate business, when it comes to gardening, the first thing to be considered is location, location, location. To grow vegetables you must have at the least six (6) hours of direct sunlight and more is better, naturally. When selecting your location; keep in mind anything that will cause shadows in the early and late parts of the growing season; such as trees, buildings, etc. As the season progresses, some spots that do not get direct sunlight early, or late in the season might get the required hours of sunlight as the arc of the sun changes, allowing you to grow the mid-season crops in this area. Your garden can be located on a sloped area, but you will have to construct the garden beds in stepped areas or leveled terraces to keep the plants and soil from washing away. You can also locate your garden in a low sitting area that stays moist, but not damp or wet; however, you will have to build raised beds (beds framed by wood boards or some other materials) to keep plant roots out of excessive water in order to keep them from rotting, but keep in mind that these raised beds will add to the cost of establishing your garden. The best spot is a sunny area, as level as possible and away from areas prone to flooding or washout in heavy rains. This will make working in and around the garden as comfortable as possible. I mentioned in the location video to stay away from trees and roadsides. This is because the roots of trees will grow far beyond the branch lines (the outer edge of the tree branches) and trees will rob nutrients that the vegetables need to grow; so keep back about 20 feet from the branch line. This also makes working the soil easier by not having to constantly fight with tree roots. Roadsides tend to carry pollutants from the road surfaces into your yard and a garden close to the road will be tempting to garden raiders (animal and human) looking for a snack, or mischief. There is absolutely NOTHING more important in gardening than soil preparation! If your soil is not prepared, you are wasting your time and money because plants will not produce without the sweat of your brow from your efforts in amending the soil, sunshine and water notwithstanding. If you have good ground, you will still have to add some nutrient amendments every year, but the initial preparations are absolutely necessary for a healthy productive garden. Soil amending is best done in the fall, but at the writing of this entry it is spring here so some things will be done slightly different than fall preparations; primarily the use of fresh manures. This soil preparation effort now will save you headaches later. Dirt and soil are words used synonymously, but they are not exactly the same thing. Soil is the darker top layer of the ground that contains the nutrients plants need to grow; such as organic matter and beneficial organisms that contribute to plant growth. This top layer is where the majority of the vegetable roots will grow to take in the nutrients needed to produce vegetables. There are three basic soil types: sandy, clay and loam. Sandy soil is generally dry, loose and drains very quickly with very little organic nutrients. Clay soil is as hard as rock; it cracks when dry and it is slimy or sticky when wet and it drains very slowly; but surprisingly it has a good bit of nutrients and that is one reason why it usually has a swamp smell. Loam is a combination of sand and clay soil with plenty of humus (decayed organic material) it retains moisture but drains well and has a rich earthy odor, but this soil type is a rarity in most areas. Nevertheless, with a little effort and a lot of humus, just about any soil can be made ready for gardening. 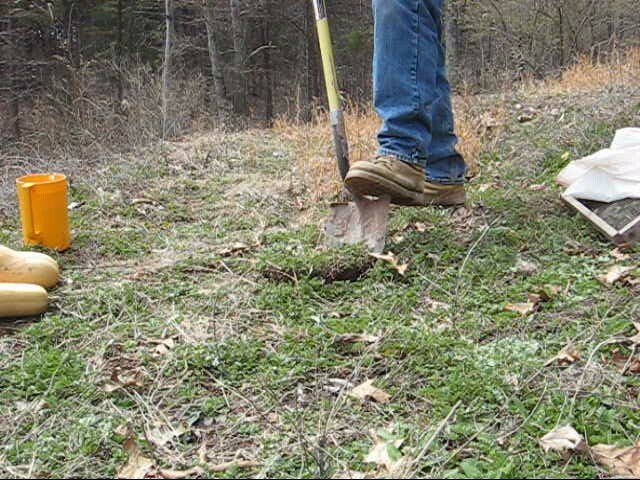 To determine what soil type you have, dig a few sample holes in the area you have selected for your garden (view episode one) and examine the type of ground you have. Take a sample of the dirt and sift out the large rocks then fill a clear plastic jar (such as a plastic mayonnaise jar) half full of your sample dirt and then fill the jar the rest of the way with water, screw on the lid tightly. Shake the jar thoroughly and let it sit undisturbed for 24 hours, then hold it up to the light and examine the results. The dirt will settle into layers; rocks and sand on the bottom followed by clay and then humus on top. Bits of leaves and other light materials will float to the top. This simple test will give you an idea of what soil type you have. There are good soil nutrient test kits on the market, but unless you send the sample to a lab you really cannot get the whole picture and your soil will differ from one area of your yard to another. However a pH test is an important test and I recommend doing this test. Plus, as I said before, you will have to add amendments every year (not as much as the first year) so we will assume you need to add everything. You may import top soil to your garden area, but many questions can arise and the most important is: where did it come from and is it contaminated with unwanted chemicals, or insects, etc? Unless your soil is all sand or all clay, it is best to avoid importing your garden soil, or be sure it is clean and tested. If your soil is mostly clay, you might want to add sand; DO NOT USE BEACH SAND because it contains too much salt, you want to use what is called clean builder’s sand. A two inch layer of sand should be sufficient for most soils and this will likely require a dump truck load. If your soil is mostly sand then you will need lots of humus. No soil can have too much humus, but you can add more humus than the plants will need for this growing season, so it is best to add humus periodically and save the rest for fall or next year. However, if this is the first (groundbreaking) year, then add as much as you can get. Soil is a symphony of elements and if any of the players are missing, or if there is too much of one and not enough of another, the plants will not produce as they should; so add a balance of amendments.